Our wonderful Prayer Shawl Group are now making Comfort Muffs, also called Twiddlemuffs, as well as shawls! Please see below for information about them. 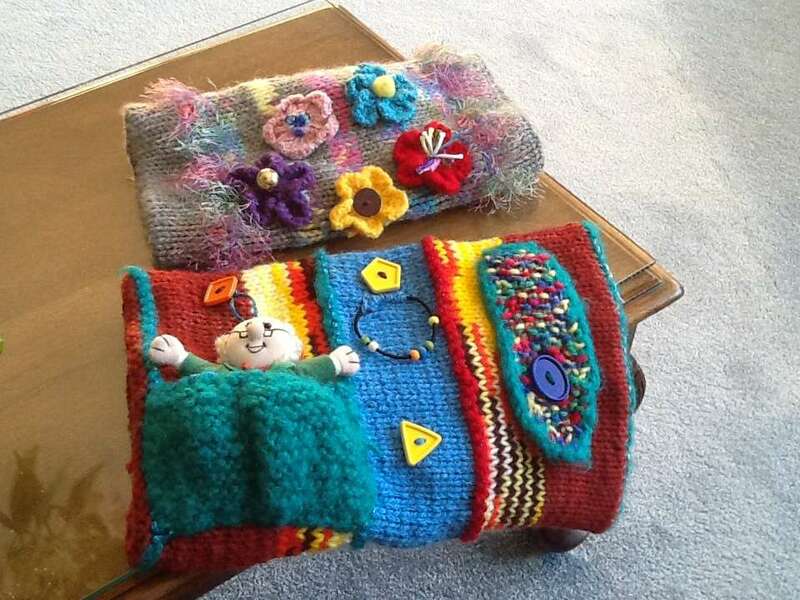 The photo shows two Comfort Muffs made by a mystery person in our Congregation. Knitting for charity is a wonderful and rewarding project. Here we discuss how twiddlemuffs can help those with dementia or Alzheimer’s disease. A twiddlemuff is a knitted, crocheted or fabric tube with accessories such as ribbons and buttons sewn on to them. They are usually made up of many yarn textures, with notions sewn on the inside and outside of the muff. This allows for the person’s hands to stay warm while they are able to twiddle with the bits and pieces. For many people with dementia, there are developments and changes to their personalities, one of which is to become increasingly agitated. Twiddlemuffs help to ease agitation and calm the person’s mood, as they can keep their hands and minds occupied. Many hospital wards have found that the muffs have a positive effect on patients by keeping them comforted, as well as encouraging movement and brain stimulation. How can I make a twiddlemuff? There are no real rules for knitting a twiddlemuff, as long as the colors are bright, the yarns have good texture, and you add some great accoutrements. You can use any type of stitch (garter works nicely), and you can knit as many rows of as many different yarns as you’d like. Generally a good size for a rectangle is 12″ x 24″ / 30cm x 60cm.